IPAW is proud of the fact that its Board of Directors have a diverse natural resource management background. The Board represents all geographic areas of Wisconsin. If you are interested in serving as a Board member or volunteer, please contact us. Michele Jasik joined IPAW in February 2013. As the Program Assistant, Michele performs several tasks: she maintains the membership database; does the layout for, edits the articles for, and emails the quarterly newsletter, “Plants Out of Place;” she tries to keep up with social media (don’t forget to Like us on Facebook); is a sometimes photographer; is a sometimes writer; takes the minutes of meetings; and (with the tremendous help of Scott) maintains the website. If you email IPAW, she is the one who will respond to you or will forward your email on to the appropriate person. 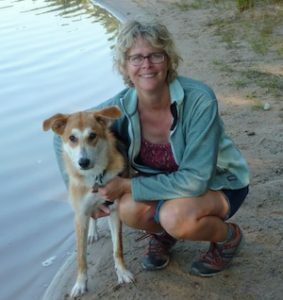 Michele also finds time to volunteer at The Nature Conservancy and for the West Madison Senior Coalition, when she is not hiking with her dog, kayaking, or on her yoga mat. She is a graduate of Purdue University’s Natural Resource and Environmental Science program. Her previous positions were working in labs at Purdue University and then at the University of Wisconsin Madison. She grew up working at a family owned greenhouse business and small farm. Michele has a life-long love of native plants, especially in woodlands. You can help to prevent the spread of invasive plants! You can start right now by joining us as a member or giving a monetary donation.